The Razor Rip-Rider is the favorite toy of many enthusiastic toddlers. Why? Simply because it looks great, rides great, and provides hours of endless fun for your child. The rear-casters allow for resistance-free drifting on dual inclined caster wheels and encourage daredevil, yet safe, spinning action. There is a 6-month warranty on the product, and the handlebars are made to have rubber grips to help your child control the vehicle better. For more control, see the Razor Dirt Quad that has 4 wheels! Looking for all-electric? Try one of these awesome electric trikes! Satisfying toddlers can be difficult. Their preferences change from day to day. A toy that may have been their favorite on Monday, may be left in the dust by Friday. Buying toys for young children is shooting in the dark, at best. That’s why it’s best to invest in something that they can use all the time. Razor’s Rip-Rider is a toy that can be used inside and outside of the house, and is ideal for riding around the neighborhood. Buying toys like the Razor Rip Rider Caster trike that we suggest here will ensure that your child is entertained all throughout their outdoor excursions. They will be able to glide, explore, ride and spin all under the watchful eye of their parent and/or guardian. The Razor Rip Rider 360 is the ideal gift for kids that are too young to have a bike, but still want to have a lot of fun. Thanks to the 360-manuverable wheels, this toy is definitely more on the daredevil side. Luckily, thanks to the sturdy grips implemented everywhere, the Razor Rider remains safe, sturdy and reliable, allowing parents to relax. Since 360 ride on toys are still relatively new to the market, we took it upon ourselves to discuss a few of its features. Hopefully the following quick review will help you decide if the Razor RipRider 360 will be ideal for your child. The Razor Rip Rider drifting trike will arrive looking like a very sporty, menacing tricycle for toddlers and beyond. With its blue colors, red accessories and white stripes going way down the seat, this toy is meant to look like it represents the word ‘fast’. The small, comic-like illustrations of whirwind and razors all around the front wheel will also undoubtedly attract any energetic toddler to try it out. Another thing worth mentioning about the front wheel is the fact that it is high-impact. Your child will be able to bump into bushes, walls or anything at all without getting too much of the impact of the hit. It’s also important to note that it’s extremely easy to assemble the wheel on backwards during the assembly-stage, which can significantly damage the bike if you try to ride it that way, therefore we recommend double-checking if it’s facing and matching the same sides as listed in the manual. One of the best features of the Razor 360 Rip Rider includes its ability to swerve, spin and drift in 360 angles. This may seem like a dangerous feature, but if the child can hold a firm grip, it’s only harmless fun. The rear-casters have been designed in such a way that they allow the child to spin and drift 360, whenever they want. The big, front rubber wheel also allows them to keep just enough grip on the road to not fall over when doing the drifting. Looking for a drifting alternative? Try out the Razor Crazy Cart for some awesome sideways action! The Razor Rip Rider is also easier to ride thanks to its 360 swerve features. This makes it different from the other tricycles on the market that have big, heavy, rubber front and rear wheels that are difficult to turn. The Razor Rip Rider is ideal for toddlers who want to have a lot of fun, and don’t want to be limited by difficult bike designs. The drifting feature on this Razor drifting trike is also well-developed, which means that it doesn’t ‘jerk’ when your child tries to turn, stop or speed-up. To help the kids stay safe, the handlebars have also been equipped with rubber grips. This helps ensure that even when your child is swerving, they will be able to hold a firm grip and stop when they wish to. They won’t have to deal with slippery metal or plastic handlebars that are usually common in other drifter tricycles out on the market. The handlebars have also been designed after the MX-Style, which will suit just about any toddler that is enthusiastic about dirt bikes and dirt road riding in general. It’s also important to note that the Razor 360 riding toy has a sturdy, steel frame that is meant to be long-lasting. After all, with all the swerving and drifting, the frame of the caster tricycle needs to be sturdy and reliable. Luckily, the double-crown fork is also there to help maintain the balance and stability of the frame. The 3-piece crank handlebars also help to reinforce the stability of the top and bottom part of the tricycle. The RipRider 360 can also support up to 160lbs weight limit. Which means that its ideal for kids above 5 years of age. The Razor Bike is also very responsive to steering, which means that your child won’t have trouble getting anywhere they want. Putting the RipRider 360 riding toy together takes no more than 15-20 minutes, and it shouldn’t be a problem to disassemble it just to make it portable again. It’s definitely worth the effort if you want to keep your kids entertained during your holidays and/or trips outside! As for the weight of the Razor Rider, it only weighs about 15 pounds, which makes it relatively lightweight if you want to carry it around, too. 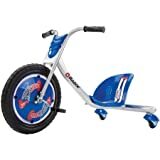 The caster tricycle also comes with an easy-to-use manual that will help you get the grasp of how your child should use the drifting trike safely. There is also no way that the RipRide will turn or tip over, as long as your child follows the riding instructions, which makes it ideally safe and reliable.It’s also very easy to assemble; many parents report that they have been able to even encourage the kids to join in into the quick initial construction of the Razor RipRider. The riding toy itself is about 27.5 x 10.2 x 14.5 inches dimension-wise, which makes it the ideal size for storing and even taking on trips. It’s not foldable, but it can also be disassembled and returned to its original state. Every parent knows that the kids can get tired easily, especially toddlers, so this is definitely a vital note. If your child does get tired, they can also just push or scoot along with their legs alongside you. The versatility of the RipRider is definitely unmatched, and it will be a good addition to just about any home that has kids that need some new entertainment. Razor has also managed to supply the market with a good, reliable batch of Razor 360s. There are virtually no defect ride on toys provided by Razor here, and that’s a vital point. Some tricycles are advertised well, but fail to live up to the expectations when you end up bringing them into your home and introducing them to your kids. Luckily, we can safely say that the Razor RipRider 360 has been a hit among both kids and parents, and has become a best-seller for good reasons. We do recommend wearing safety gear when using the Razor Rip Rider. Another good thing about the Razor 360 is the fact that it appeals to both younger and older kids. For example, if you have several children aged between 5-10 years old, they can all safely use and take turns with the RipRider. Many customers report that kids as young as 4 and as old as 8 can all have fun with the drifting trike, and it’s perfect to keep the kids occupied during family grills and/or gatherings. The RipRider should ideally be ridden on smooth, black roads, pavements and/or driveways. It’s definitely not meant for on-grass or on-dirt riding, which means that kids who live in more rural areas, around forests and fields, won’t have as much fun with it. If you are interested in similar tricycles to the Razor RipRider, we can wholeheartedly recommend the Razor FlashRider 360. Unlike the RipRider, the FlashRider has dual inclined caster wheels, that allow for extra swerving and gliding. The caster trike also has firm, rubber grips, a three-piece crank, double crown fork for balance and stability and a Spark Bar feature. This caster trike is ideal for kids above 6 years of age, and will require a bit of assembly. Luckily, putting it together shouldn’t take more than 15-20 minutes to put it together with the manual in hand. You can also consider the Razor Powerwing scooter. Any toddler above 5 years of age is able to ride the Razor Rip Rider. Some customers have already stated that kids as young as 4 can even give it a go, as well as kids as old as 12. It’s the perfect toy to gift to your child, and is the ideal toy to encourage siblings playing together. Many grandparents state that they use it as a grandpa/grandma house toy when their grandkids come over to play. We like the Razor RipRider 360 thanks to its well-designed 360 swerve feature. It’s safe, and reliable, and even though can kids go to some impressive speeds at times, no serious injuries have occurred when riding the RipRider so far. This is all thanks to the well-designed, sturdy steel frame, rubber-grip handlebars, and well-positioned seat that distributes the rider’s weight accordingly when they ride and swerve. 360 degrees of ultimate spinning action!